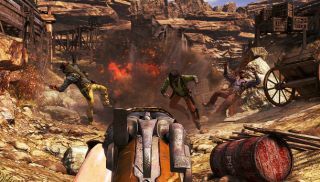 After last week's sombre reflection on the nature of shooting some folks, today we get to see Call of Juarez: Gunslinger's Silas Greaves philosophising while shooting some folks. You just don't get that combination of high-minded rhetorical questioning and quick-draw action outside of the Wild West. Although maybe Greaves would find an answer to his ponderings on "what freedom means" if he'd only stop shooting people long enough to hear their reply. From the highfalutin press notes, we learn that Greaves encountered many of the era's most enduring legends. He's like Forrest Gump crossed with Clint Eastwood. "Silas Greaves has some incredible stories to tell, and players will live them while he is narrating. During his life he was a part of many historical events and an actor in as many legendary gunfights. He lets players face off with some of the West's most notorious names, such as Pat Garrett, Jesse James, Butch Cassidy, and many more."